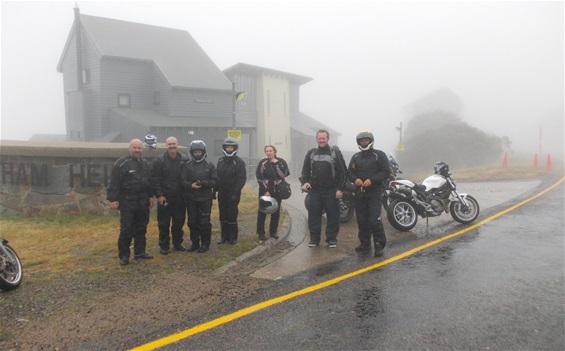 Snowy Mountain Way – What a spectacular ride! Having left Melbourne on Friday 14 February via Warburton and the Reefton Spur, Marcus and Berni, Stig and his mate Jon, also originally from Norway, settled into their respective accommodation in Bright and enjoyed dinner at the pub and local boutique beers from the Bright Brewery. There always seems to be something happening in Bright and this weekend was no exception with the town staging the Australian Adventure Travel Film Festival for 2014. Steve (aka Sergeant Bilko) and Bennie, Mike and Irene left Melbourne on Saturday morning at 7am precisely travelling at the recommended speed limit (LOL) through Healesville and Bonnie Doon (ahhhh the serenity) to arrive at Whitfield just after the rain, that had been threatening all day, gave us cause to slow our pace. For this reason, and this reason alone, we decided to stop at the Whitty Cafe - the scones and coffee had nothing to do with it!!! 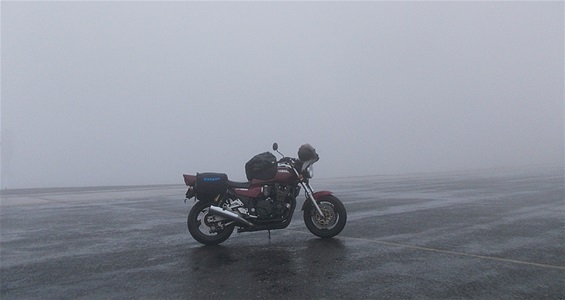 Stig, Jon, Marcus and Berni awoke to the sound of rain and when it seemed to have set in they cancelled the ride to the mountains opting for a leisurely morning in Bright, a long breakfast and taking in the sights of the town. 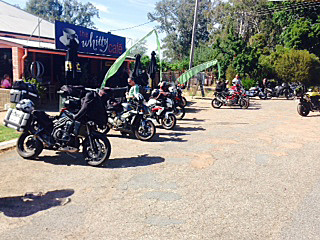 We arrived in Bright at 1pm and joined the rest of the gang at an adventure motorbike display that seemed to get everyone thinking about bigger, better trips, new xxxx dollar bike gear in bumble bee, high-viz colours and lofty thoughts of transporting motorbikes overseas. Mike, at this stage, would have been extremely grateful just to have been able to buy dry socks but was reasonably content to have lunch. 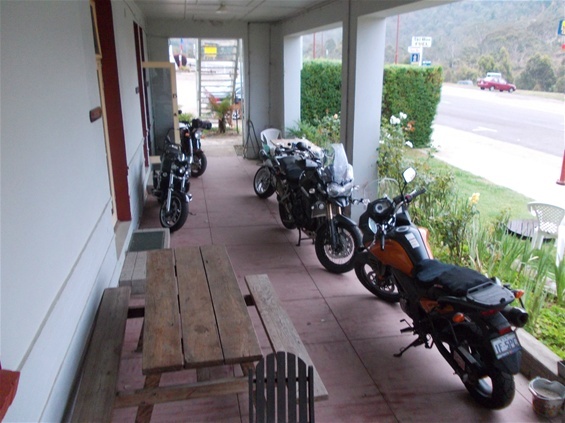 We set off through Dinner Plains to Omeo, where we took refuge at The Golden Age Pub – a truly wonderful old country pub – parked our bikes on the verandah and settled in for a round or seven of well-earned drinks. The place ticked all the boxes and we all thoroughly enjoyed our stay. The following morning we said our sad farewells to Stig and Jon, who had to go back to work, and made our way north of Omeo on C543 Omeo Highway (newly sealed for the main part) past Blue Duck where we meet up with a gang of Harley riders (really nice fellows as it turns out – who’d have thought?) and beyond to Mitta Mitta – absolutely one of my most favourite rides in Victoria. Lots of twisty bends and spectacular bush scenery - following the Mitta Mitta River all the way to Tallangatta. After lunch we rode around the southern end of Lake Hume to Tangambalanga and down to Kiewa where we joined the Kiewa Valley Highway C531 to Running Creek and beyond to the township of Mt Beauty. Much to the profound joy of Marcus, we managed to find a bakery. Unfortunately, I don’t believe he could find anything he fancied that began with the letter ‘M’ and, as he and Berni were still recovering from post-traumatic events of the previous day, they decided to head back to Bright and check in to lodgings at the Coach House Inn (fantastic king-size beds, reasonably priced and centrally located). Our night in Bright was wonderful! And despite my fish being absolutely horrible, we had a terrific time – Berni, Irene and I stayed up well beyond the boys having great deep and meaningfuls about life!! Too soon the morning arrived and Sergeant Bilko is calling revelly. Fortunately, the sergeant stepped in some doggy-do-do, tramping the foul-smelling stuff throughout our room, and this gave us a few extra minutes between laughs to get our acts together. We enjoyed a wonderful breakfast at the Whitty Cafe!!! where trillions of bikers converge in Whitfield. 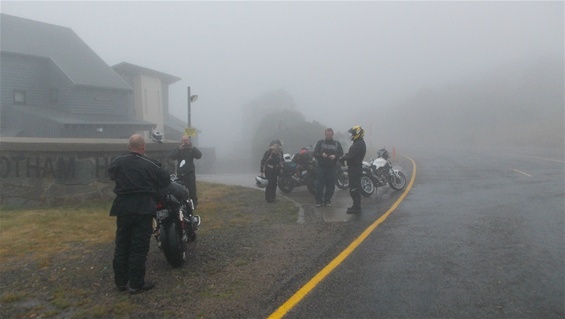 At Mansfield we decided, on the advice of some fellow bikers, to turn on to the Mansfield/Woods Point Road and turn left just before Jamieson onto the Eildon/Jameieson Road that follows the Lake Eildon National Park to Eildon. This was a highly rewarding decision as the scenery was, yet again, truly spectacular. With heavy hearts we said our farewells at Healsville already planning our next adventure!! I had a wonderful trip, laughed heaps and learnt many things about the strange, wonderful people I ride with........Marcus has a fetish regarding bakeries, Berni now has a problem with Mt Hotham, Irene has some real phobias regarding coconuts, Mike is seriously concerned about wet socks, Jon may need glasses to help his tunnel vision, Stig is very funny but he needs a few more bikes, Steve has a speed addiction (and I’m not talking about the stuff that you snort) and I am.... without fault!! - Bennie. These are the sort of conditions Berni loves to ride in.. 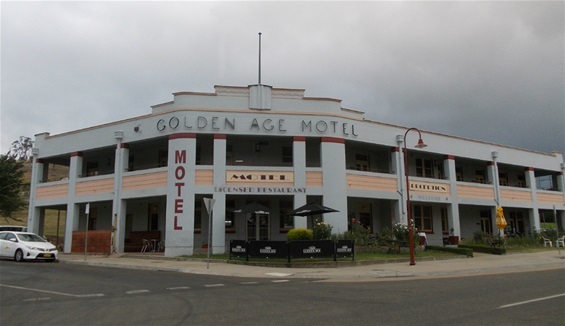 The beautiful Golden Age Hotel in Omeo was a welcome sight after a taxing ride. Even the bikes got to enjoy the facilities at the hotel. 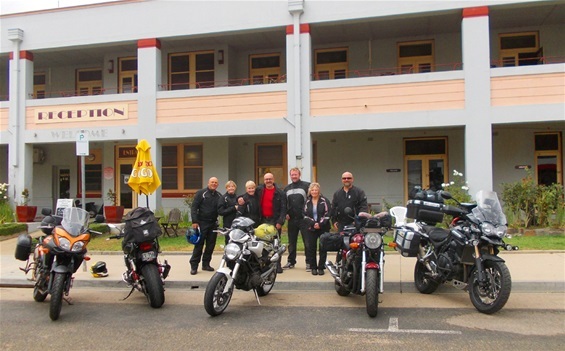 The crew in Omeo on Sunday morning. Farewell to Stig and Jon. 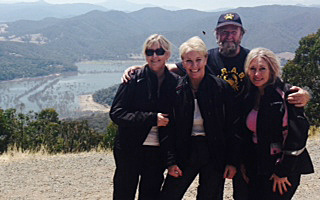 Irene, Bennie, Marcus (with beard) and Berni overlooking the fabulous Eildon Weir. Breakfast in Whitfield. A great place to stop.